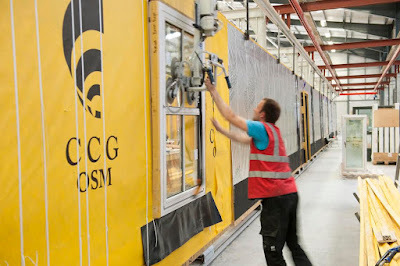 Lloyds Bank’s latest annual house building report, released today, reveals that 68% of British firms are investing in modular housing, while 56% are putting cash into panelized systems of construction. Average investment in new building techniques is now 24% of turnover, up from 20% five years ago. The report also found that more than half of house builders say the Bristish government’s affordable housing obligations give them cause for concern – with 45% saying they are able to meet thresholds but are worried about the impact on profits and another 7% saying meeting affordable housing policies has an “unduly negative effect on margins”. Just over a third (34%) said they are able to meet affordable housing obligations with no issues. Housebuilders’ motivations to adopt these methods include improved efficiency, ease of build, better construction standards and in some areas increased margins. As a result, firms’ investment in new building techniques has increased year on year from 20% of current annual turnover to 24% over five years. Innovation is also supporting the delivery of sustainable homes with 82% of firms saying they are more focused on this issue than ever before. An ongoing shortage of skilled workers continues to affect the sector with a third (31%) of firms saying there is a skills shortage at a national level. More than a quarter (29%) said they have trouble recruiting skilled workers in the regions where they operate.